This type of fan is characterized by high efficiency and a significant increase in static pressure. The fans are equipped with impeller wheels with forward-curved blades driven by motors with a rotating casing. If necessary, the cover can be easily removed by sliding the bolts out of the hinges. The fan can be installed in any position. 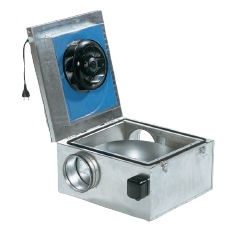 The fan casing is made of galvanized steel sheet, thermally and acoustically insulated with a layer of 50 mm mineral wool, protected from the inside by galvanized, perforated steel sheet.